The Blizzard Bike announced its 2011 race calendar this week, with 103 road, mountain, duathlon and cyclocross events. The season opener will be March 6th with the tough, early season Baldonnel road race with the final event on October 30th. The Blizzards will defend their Challenge Cup against Grande Prairie and Dawson Creek in 9 races, held throughout the year. The season breakdown includes 24 time trials, 11 Cyclo cross races, 21 mountain bike races, 5 duathlons, 1 triathlon, 2 hill climbs and 19 mass start road events. The long distance Randonneur series has 10 events with local riders doing the 1200 km Paris-Brest-Paris event in August. 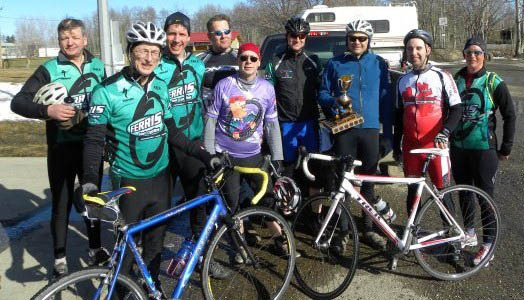 Rides with the club coaches will start in June and will have 10 weekly sessions. Winter turbo training continues two days per week until the end of March and (hopefully) spring weather is here. Club triathletes will be doing the regional short distance triathlon series as well as the Penticton Ironman. Club triathletes can practice their skills with e 5 event Duathlon run-bike-run series. A duathlon is a good way to start learning about triathlons. The mountain bike races were greatly expanded to 21 events on the club’s new ‘Beatton Cactus’ circuit. Wednesday weekly MTB races start at 7 pm April 6 on the Cactus Trails. A few new Sunday race start times and new race circuits will be introduced. The King/Queen of Spring and spring 15 Mile time trials will be moved to the Old Montney Highway from the Upper Pine Road. The Blizzard Bike Club is in its 29th year of existence, having started in 1982. Last year’s membership was 84 members. Go see ‘Ferris Fast Cycles’ or call 250-785-3711 for more information. All it will cost you is a $40 club annual membership to take part in these events. Cycling is a great way to get fit and have fun at the same time. Take advantage at the excellent regional cycling routes. If you are interesting in some fun and want to learn how to bike in a recreational atmosphere, the Blizzards are for you! The club schedule, news and events are available at www.ferrisfastcycles.com under ‘Upcoming Events’.